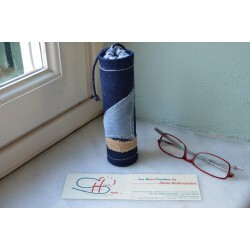 we create pretty cases for glasses, that splash some colour and elegance in our daily life. Group B-Paper There are 11 products. 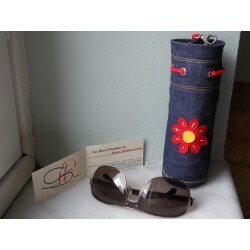 Spectacle case – Jeans – Red Daisy - Large, suitable for sunglasses & large reading glasses. 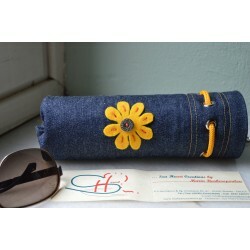 It is made from cotton jeans, decorated with a red daisy made from baize with a metal button, which closes on top with a yellow waterproof string. It also contains a metal hook for hanging. Internally it is reinforced with a paper roll (kitchen roll – large). 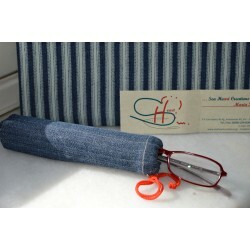 Spectacle case – Jeans – Patches-Sail, suitable for sunglasses & large reading glasses. 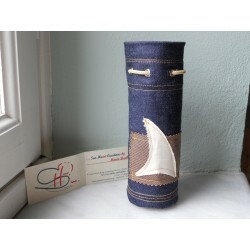 It is made from cotton jeans, decorated with patches of jeans and canvas fabric, in sail shape, which closes on top with a beige waterproof string. It also contains a metal hook for hanging. Internally it is reinforced with a paper roll (kitchen roll – large). Spectacle case – Beige/Military-Large, suitable for sunglasses & large reading glasses. 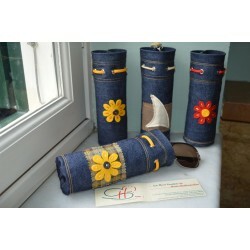 It is made from beige cotton jeans, decorated with cotton jeans camouflage fabric, which closes on top with a black waterproof string. It also contains a metal hook for hanging. 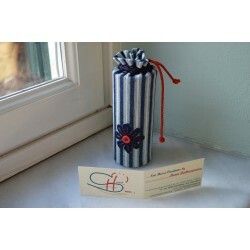 Internally it is reinforced with a paper roll (kitchen roll – large).